Green-fruit sedge is a perennial, rhizomatous species of very restricted range in North America. It is reported only from British Columbia, Washington, Oregon and Idaho (USDA 2011). In British Columbia, it is found only in the extreme southwest of the province, in streamsides and wet places. In his rare plants of the Fraser Valley article, Lomer (2011) says: "Until about 1996 this species was rarely collected or seen in BC. In subsequent years it has proven to be an abundant species, but one of rather restricted habitat in the Fraser Valley. It grows primarily along the eroding firm mud banks of the Fraser River and proximal tributaries from Hope to Surrey (UBC: Lomer 97-36). Rarely elsewhere such as a boggy ditch in Richmond near the Fraser (UBC: Lomer 96-20). Still rather rare overall and somewhat threatened by habitat destruction, especially dyking for riverside development. It looks somewhat like Carex lenticularis Michx., except that it is rhizomatous and grows in dense colonies, the lowest spikelet is often remotely flowered in the proximal portion (interrupted) and the perigynium is smaller." Extracted fromBotanical Electronic News #432, January 2011, with permission. A detailed description of this species is provided by Ball and Reznicek in Flora North America. 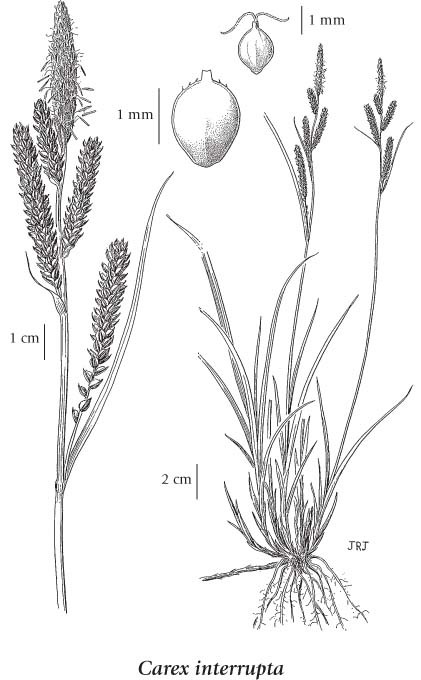 A detailed discussion of the genus Carex is also provided. Perennial, tufted herb from long, creeping rhizomes; stems triangular, with blunt, smooth edges, 20-70 cm tall, equalling the leaves. Sheaths tight, short; blades flat, well distributed along the stems, 2-5 mm wide, the lower ones reduced. Spikes 3 to 10, the terminal spike with male flowers, the lower spikes 2 to 9, with female flowers, with short stalks, 3-9 cm long, cylindrical, erect; bracts subtending the spikes leaflike, sheathless, the lower ones longer than the inflorescence, the upper ones reduced. Perigynia broadly elliptical, 1.5-2.1 mm long, 0.9-1.4 mm wide, brownish-green, 3-angled, the angles rounded, smooth, often ruptured by the developing achenes, the beaks short, entire; female scales egg-shaped, equalling or surpassing the perigynia, brownish-red to purplish-black, with lighter 3-nerved centres, with translucent margins; stigmas 2; achenes lens-shaped, 1.1-1.5 mm long. Streamsides and wet places in the lowland zone; rare in SW BC; S to S OR. Carex interrupta var. distenta Kük.